The Royal Rumble is playable online. That in and of itself is awesome, the only match I used to play in the old SNES WWF games was the Rumble and it was always my favorite event in the Federation so this news in particular is very welcome- even for someone who doesn't really play online all that much. There's also a WWE Shop that will offer a load of DLC right off the bat; including superstars, legends, areas, and more. It's sure to piss off everybody in the 'why wasn't this just on the disc?!' crowd. 'Community Creations' is a feature that I thought was new, but was apparently in last years game as well. It's essentially a bulletin board where you can post your creations and storylines for download a la Little Big Planet. This is a potentially purchase worthy feature in and of itself since it erases all the hours of making your favorite snubbed wrestler, after all- why do it yourself when you could just get someone else to do it for you? I remember when 'WWE Legends' came out I was making guys left and right, it felt like the good old days of No Mercy and Wrestlemania 2000 on the N64 all over again. Which was fun, but it took an eternity. Things went a little faster when I found a really terrific site that hosted recipes (complete with screenshots!) of created superstars. Then it was a simple 'follow the lines' kind of thing- Community Creations might erase the need for sites like that. Which is kind of a shame really. Without question, WWE SmackDown vs. Raw 2011 contains the best online offering in the 12-year history of our franchise. Not only do we have new features like the Online Royal Rumble and WWE Shop, but nearly every aspect was polished to increase the quality of this robust feature set. In the past, WWE SmackDown vs. Raw 2011 offered up to four players online. While this allowed for a large variety of matches, it excluded all the five and six-man ones that our fans love, such as the Championship Scramble, Money in the Bank, Elimination Chamber and Royal Rumble. These match types have all been carefully added with latency concerns in mind, as well as thoroughly tested, to ensure quality performance. In particular, the Online Royal Rumble has the ability to support up to 12 human players in the 30-man mega-event. As a result, in WWE SmackDown vs. Raw 2011, not only will players be able to compete with more people in more matches, but they will experience less online latency. 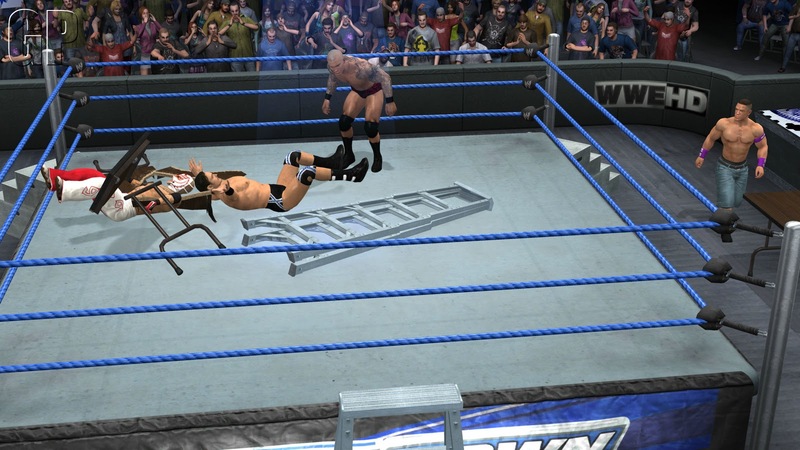 As the industry leader in user-generated content, last year’s effort, WWE SmackDown vs. Raw 2010, introduced WWE Community Creations. This feature allowed players to post and share their created Superstars, finishers, story designs and more. In its debut year, roughly 10 million creations were downloaded by our community! This year, we’ve added the ability to share Paint Tool Logos and Created Move Sets. Additionally, we’ve included the ability to edit downloaded content so players can edit any content they download from their fellow consumers to make them unique for their own rosters. Finally, the search tool was dramatically enhanced so the community can share and find quality created content with greater ease. Everything players do online earns points toward their online rankings and leaderboard scores. Just like in WWE, while winning matches is important, more points are awarded for quality performances. The more users who download community creations, the more the creator’s rank will grow in the leaderboard rankings. Even reviewing content will earn points. With online being heavily focused on competition, we’ve blown out the amount of ways the community can challenge one other for bragging rights. With over 30 leaderboards in WWE SmackDown vs. Raw 2011, including one for Community Creations, players have multiple ways to find their niche and go after that coveted #1 spot. WWE SmackDown vs. Raw 2011 features the largest downloadable content offering in franchise history. Players may have heard about some of the cool content we will be offering, such as WWE Superstars, WWE Legends, new ring gear and playable arenas, but we are also offering packages and ala carte items as well. The WWE Shop allows the community to easily find and purchase the content they want. We can’t wait for our fans to log on to WWE SmackDown vs. Raw 2011 and hear their reaction to all of the quality features the mode offers.